Members of a New Zealand club which denied a Sikh man's entry because he was wearing a turban say the issue has nothing to do with racism and they are ready to defend their rules in court. 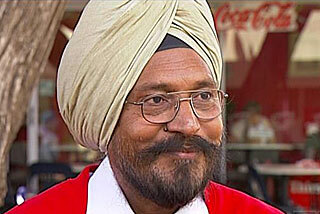 The Sikh Council of New Zealand is seeking action from Human Rights Commission against the south Auckland's Manurewa Cosmopolitan Club after volunteer worker Karnail Singh was barred entry because his turban breached its no-headwear policy. The issue was not one of racism, said Con Linton, a member since the late 1960s. He said the 3,500-member club has members belonging to different culture including Asian, Iraqi, Pacific Island, Pakeha and Maori. "You could possibly stereotype us and say we are rednecks with people who do not like turbans but that would be democracy at its worst. Where it (the headwear policy) originated I don't know but people have never found it hard to conform with - until lately," he said. Several club members said that it "has access to barristers and solicitors like anyone else" and will fight any moves to enforce changes, The New Zealand Herald reported. "To me it would appear the feeling is quite clear that we are a private club with its own rules much like many other clubs throughout the country," said Peter Kelly, a member for 43 years. "But if there is an enforcement on this particular issue on the Manurewa Cossie club, it surely will have repercussions on other clubs and some of their rules in general. "I think we would fight - why wouldn't we ?" Kelly, 75, said the turban issue was raised at the club's annual meeting last Sunday, where only five of the 304 people voted to amend the policy of excluding religious headwear. "I daresay that if I went down to the Sikh temple I would take my shoes off ... that is one of their conditions I believe, so if it is I would just comply," he was quoted as saying. "All we are saying is just comply with the rules of the cossie club." Sikh Council spokesman Verpal Singh believed at least one practicing member of the Sikh community had entered the club wearing a turban, but this was denied by the club's manager, Patricia Rangi. "We had asked them to resolve this anomaly and bring their definition of headwear in line with the courts of law and RSAs and other cosmopolitan clubs which would not bring the turban under the curfew on headwear rules that they have," Singh said. He refused to comment when asked if the issue was a case of intolerance towards other cultures.